This spacious 2 bdrm / 2 full baths + den has just been FRESHLY PAINTED throughout. Great Room is bright & open w/ 9' ceilings & access to lg balcony. The LR overlooks the central courtyard & features a cozy gas fireplace. Expansive kitchen offers maple cabinets, glass mosaic back splash, new garburator, SS appliances & breakfast bar. Private Master includes a lg walk-in closet & 4pc spa-like en-suite with jetted tub. This floor plan beautifully accommodates a room-mate situation with 2nd bdrm & full bath on opposite side of unit. Den w/ glass door makes a great home office & could easily fit a pull-out couch for guests. Comes complete with underground titled parking, storage, car wash, gazebo, social area & in-suite laundry. Quiet & secure building includes intercom, FOBs & cameras. Conveniently located just steps away from Repsol Centre, one of Canada's top fitness training facilities. 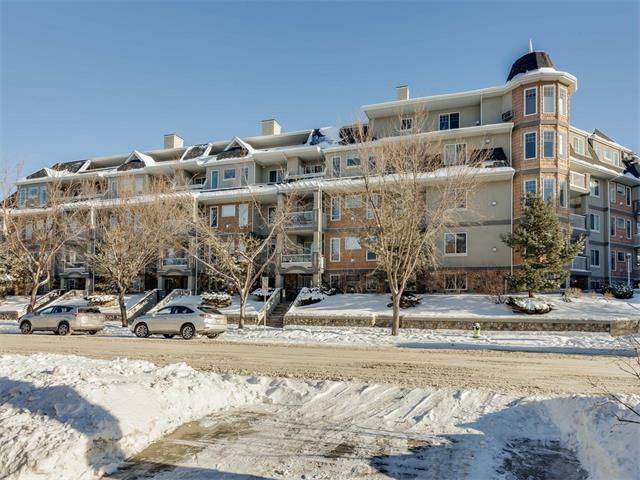 Short walk to DT, LRT, Saddledome, & all the trendy shops & restaurants on 4th St & 17th Ave SW.